Target wants you to have a connected home. It even created a showroom called Open House in the middle of San Francisco to help its shoppers figure out how such a home is supposed to work. But a side effect of this new mini store is that it could show device makers how the Internet of Things should work. With a combination of vignettes meant to show off situations that can be solved with the help of a connected home and so-called Deep Dive tables that showcase a product's features, the retailer aims to educate its shoppers. But while a controlled room carefully decorated with gadgets is cool, it's those tables that will give shoppers a sense of how something works both on its own and with other products. It's an interactive window into which devices are truly connected and are trapped in a manufacturer's ecosystem. 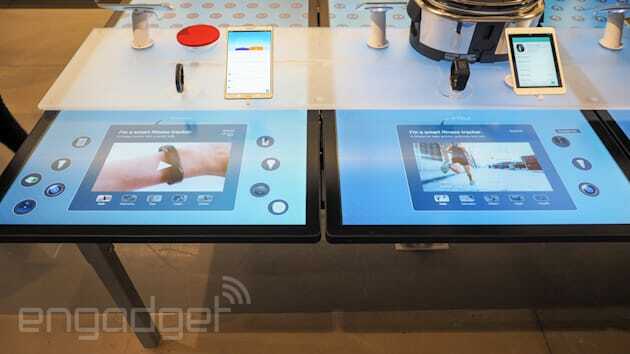 Each product on the Deep Dive table is accompanied by a large touchscreen. Tap the display and a presentation about the gadget appears. You can learn all about Tile or the Quirky hub by tapping on subject heads. But it's the bubble icons around the product presentation that could force some device makers to rethink their strategy. These satellites are the other wares available at Target that work with the current item. Tap on one of those products and the display shows customers how they work together. Whether it's a native connection or via third-party scripting services like IFTTT or Yonomi, the tables give potential customers a peek into how a particular device will work with other IoT items. While some devices were shown to work with other items, some only worked with just one other thing, and in some cases nothing at all. When competing products are placed next to one another, it gets interesting. Two fitness trackers sat side by side: the Fitbit Surge and the Jawbone Up2. According to the Deep Dive tables, the Jawbone tracker works with nine other devices, while the Fitbit only works with three. Sure the Surge is the more robust device, but when you compare its $250 price tag with the Jawbone's $100 and the fact that it works with fewer devices, it's a tough sell. Target is surfacing this information quickly and easily and that's great for products that embrace working with other devices or with IFTTT or Yonomi. For manufacturers that have decided to tightly control how their gear works with others, this could be the moment that reminds them that a connected home means connecting outside the four walls of their test lab. The company will be sharing data and feedback with the manufacturers of the 35 devices available for purchase in the store within a store. It even plans to showcase prototypes in the Open House. Unfortunately, Target has no expansion plans for the project. So its enormous potential influence on what gets purchased by consumers in this country won't be truly felt by device makers. But if the data that comes out of the Open House shows that creating devices in a vacuum is a surefire way to be ignored by shoppers and manufacturers start working on ways to make their wares work together, it will have still helped shoppers in towns without fancy interactive rooms and giant tablets at their disposal.